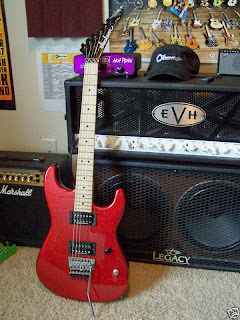 The Guitar Column: Jackson Custom Shop Steve Vai 'Crossroads' Replica Guitar On eBay! Jackson Custom Shop Steve Vai 'Crossroads' Replica Guitar On eBay! 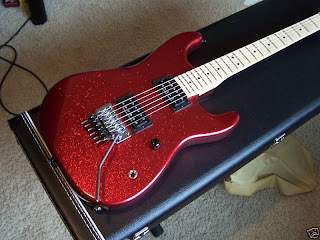 A replica of the axe that Vai shredded, teased and strangled in the movie in a 'gu itar duel' with the hapless Ralph Macchio, this Jackson guitar is apparently a one-off made in the US Jackson Custom Shop. According to the seller, this particular axe features an oil-finished early-80s style Charvel neck (read: wide and flat but not too skinny at the back) with a compound radius fingerboard with rolled edges, ash body, Seymour Duncan JB and '59 humbuckers and a Floyd Rose trem. All topped off with a stunning Candy Apple Sparkle finish. Is it time to air out those leather pants or what! Now I've sworn off Floyd Rose bridges for the last 15 years but this Crossroads-inspired Jackson Custom Shop has piqued my interest in a locking-bridge axe again. If only I had that guitar in my hands right now....My dream search for that guitar would be over. But what's with the sparkle? It sure does not seem sparkly in the film..